THRAWN: Commander Jun Sato. I wondered what it would take to motivate your return to Mykapo. THRAWN: Yes … until we meet again. In the meantime, the members of “Iron Squadron” are three kids – Mart, Gooti, and Jonner. 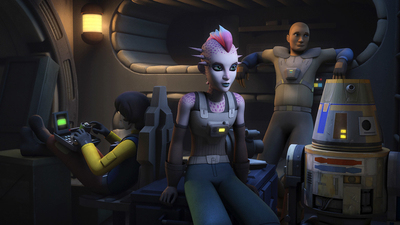 Thankfully, only their first names are given in the episode, as the full names of two of them are dead giveaways or their real-life inspirations – Mart Mattin (for Matt Martin of the Lucasfilm Story Group), Gooti Terez (for Andi Gutierrez of The Star Wars Show and Rebels Recon), and Jonner Jin (for John Harper of The Star Wars Show). Sure, because I’m a Star Wars fan of a certain level of obsession, this is inside knowledge that would have taken me out of the story had I heard either Mart or Gooti’s full character names. Jonner, though, was definitely better named comparatively speaking. 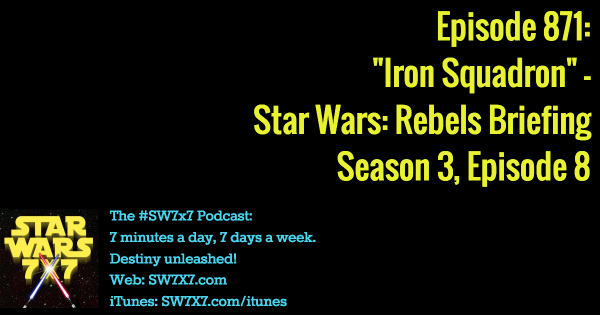 A minor quibble in an otherwise intriguing episode that also sees Thrawn testing his own, this time Admiral Konstantine, who gets too cute in his attempt to destroy the Ghost and Iron Squadron, and pays the price for it. What did YOU think of the episode? Share your thoughts in the comments! Today’s question: Who are the three people with a writing credit on The Force Awakens?